This tutorial will teach you how to download the Ubuntu 9.04 ISO from Ubuntu Linux’s Website at Ubuntu.com to burn the Ubuntu Linux ISO to a CD with Deepburner which is a free CD burning program for Microsoft Windows which is capable of burning the Ubuntu Linux ISO to a CD, so you can start your computer from the Ubuntu install CD which you burned with Deepburner to install Ubuntu Linux on your PC. 2. Download Deepburner from http://www.deepburner.com/?r=download I recommend the DeepBurner Free 1.9 free since it is free and it works. 3. Put a CD-R, DVD+R or DVD-R which have 700 MB of Space or greater into your CD or DVD burner drive. I recommend Verbatim, TDK, Taiyo Yuden, Maxell they make good Disks. 4. 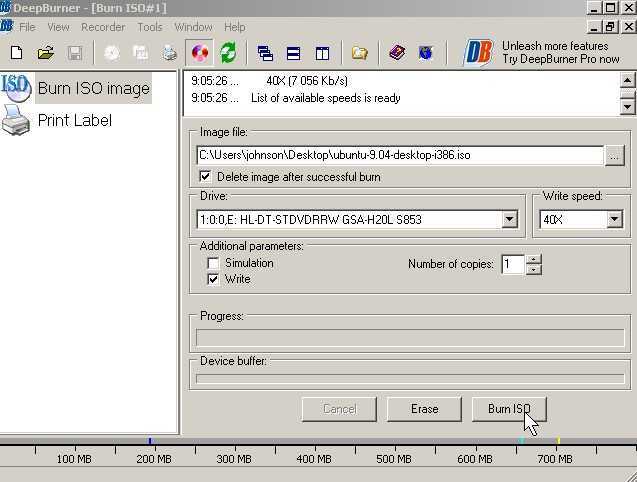 Start Deepburner, and Choose “Burn ISO image” from the Select Project window, and press next. 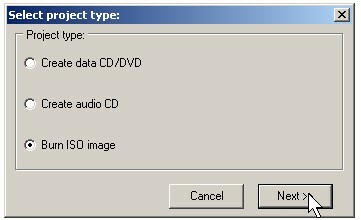 5.Press the […] button and pick your CD-Burning drive, and choose your cd burning speed. 6. Click the Burn ISO button at the bottom right.